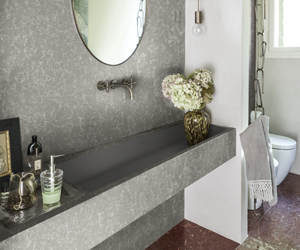 Corian® Quartz offers an attractive visual focal point for your bathroom designs. With a resistance to mold and mildew, Corian® Quartz creates an inviting, easy-to-live environment. Designers of educational environments choose Corian® Quartz because it combines high-performance characteristics with extraordinary beauty. Complementing the compelling beauty of Corian® Quartz is simple. It’s a perfect match for the other materials in your design. You want your retail store design to stand out from the crowd. Yet, sometimes it’s hard to serve up that essential brand image and still hit the performance requirements of a high-traffic retail space. For all kinds of home styles, Corian® Quartz can bring your residential designs to life. A first impression is a lasting impression. Make sure to leave the right one with reception counters made with Corian® Quartz. Public spaces require designs that offer a clean, inspiring aesthetic, along with the durability to meet the rigors of high-traffic areas. That’s why so many designers of corporate and public spaces choose Corian® Quartz. From luxury yachts and cruise ships to offshore platforms and research ships, today’s architects and designers are creating inspirational nautical designs with Corian® Quartz. Create inspired Corian® Quartz kitchen countertops that flow smoothly into Corian® sinks to bring imagination and practicality to your design. Corian® Quartz elevates the most innovative contemporary hospitality designs. Leading international designers use Zodiaq® to make surfaces beautiful, ultra-functional and comfortable for hotel guests. Healthcare design’s first priority is to prevent infection. The surfaces you specify play a critical role in helping you create safer healthcare environments. Corian® Quartz will stimulate your appetite for creative food service design. This industry-leading surfacing material has attributes that make it beautiful and and hygienic.